Antalya, Tuesday May 27 - Antalya Convention Bureau attended 12th Frankfurt IMEX on 20-22 May in Germany. Nizamettin Şen, President of Antalya Promotion Foundation and Sinan İnan, General Director of ACB welcomed various hosted buyers from all over the world. ACB stand, set in Turkey stand with the other Convention Bureaus in 400 meter square tried its best to present and introduce itself on behalf of Turkey. Turkey stand with theme of ‘Home’ has called its guests to see and shift expectations in manner of tourism and life on a larger scale serving with calm hospitality. 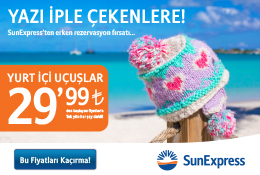 ACB worked in cooperation with ICVB before and during IMEX-Frankfurt to explain and attract the hosted buyers why they should choose Antalya, a new born star among congress destinations. According to ACB statistics which were being collected across the city, 54 international congress have been held in 2013. 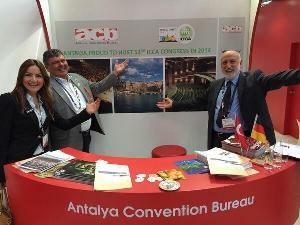 But now Antalya has been preparing to be host 53rd ICCA Congress in November, 2014. Therefore, Antalya has been making a name in the meeting industry with annual ICCA Congress and aims to raise the bar in the industry.